Urban Trend gadgets add a unique twist to "ho-hum" kitchen tools that bring together value, looks, quality and function. We stive to create products that solve problems and provide clever soutions for kitchen gadgets so that you can focus on what's important: cooking great food! Urban Trend's Hometown Bagel Knife is not just for bagels! Hometown Bagel Knife effortlessly slices bagels, breads, baguettes, biscuits, croissants, dinner rolls, English muffins, and buns without crushing them and without fear of cuts and injury. Hometown Bagel Knife is dishwasher-safe and is easy clean. 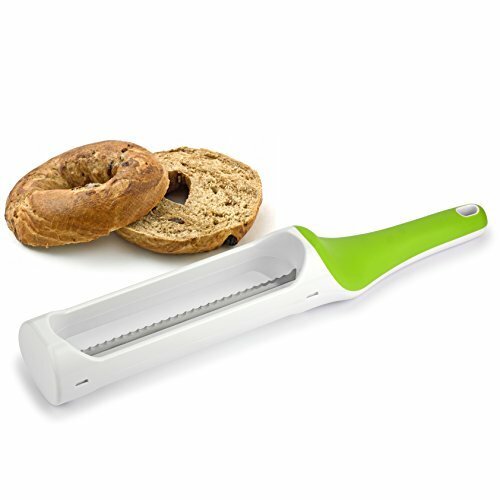 - EASY TO USE: Safely and effortlessly slices bagels, breads, baguettes, biscuits, croissants, dinner rolls, English muffins, and buns without crushing them and without fear of cuts and injury. - SAFETY FIRST: Designed to keep your fingers and palms protected and away from the blade at all times. - HIGH QUALITY: Made from high quality food safe plastic and stainless steel blades. - EASY TO CLEAN: Top-Rack Dishwasher Safe so you can spend less time cleaning and more time enjoying your bagel! - SATISFACTION GUARANTEED: Our products are manufactured to the highest quality. We offer a five year guarantee on all Urban Trend products. If the product shows any signs of defect when used as it is intended, please contact us with the relevant purchase receipt and you will receive a replacement for eligible returns. EASY TO USE: Safely and effortlessly slices bagels, breads, baguettes, biscuits, croissants, dinner rolls, English muffins, and buns without crushing them and without fear of cuts and injury. SAFETY FIRST: Designed to keep your fingers and palms protected and away from the blade at all times. HIGH QUALITY: Made from high quality food safe plastic and stainless steel blades. EASY TO CLEAN: Top-Rack Dishwasher Safe so you can spend less time cleaning and more time enjoying your bagel! SATISFACTION GUARANTEED: Our products are manufactured to the highest quality. We offer a five year guarantee on all Urban Trend products. If the product shows any signs of defect when used as it is intended, please contact us with the relevant purchase receipt and you will receive a replacement for eligible returns. If you have any questions about this product by Urban Trend, contact us by completing and submitting the form below. If you are looking for a specif part number, please include it with your message.